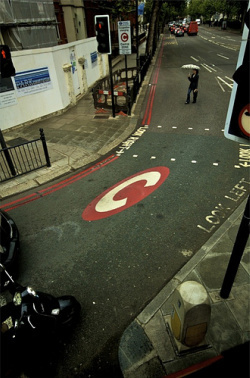 Western Congestion Charge To Stay? Dean Nicholas Western Congestion Charge To Stay? The screeching sound of another U-turn on a standout Boris policy has reached the ears of Kensingtonites: the deadline of next spring for the removal of the western congestion charge zone, introduced in 2006, has been postponed, according to an ever-so-excited Standard, which reckons it's got an exclusive. The recession, which has already led indirectly to a hole in TfL's money pot and the prospect of further fare hikes, means that the Mayor is reluctant to remove a zone that pulls in between £55 million and £70 million annually, according to the newspaper. Interestingly, Boris originally pledged to remove the zone in order to help what he described as a "[economically] already struggling" area (does he think things are rosy in Canning Town?) and suggested the shortfall might easily be topped up by TfL's budget. Cut and dried, then? Apparently not. The Mayo'rs minions have already denied the report, and claimed that the western zone will indeed be scrubbed from the streets next year. But when, exactly? Dave Hill has squeezed a promise out of transport advisor Kulveer Ranger that it'll definitely go, but there's no timeframe yet. Don't be surprised to see dayglo-wearing workmen removing signs and painting tarmac minutes before midnight on December 31st next year.